One of the most appealing features of an ADT Pulse system is the ability to interact with it while you are away from home. Whether you are using a cell phone, a tablet, a laptop, or just your voice, your ADT Pulse system lets you check-in and arm or disarm your system on the go. Check out these 4 ways to remotely arm and disarm your system from anywhere and at any time. These handy remotes were once your only option if you wanted to arm or disarm your system "remotely" (from within your home or just outside in the yard). Key-chain remotes remain popular because they are so straight forward to use; one button arms, another disarms. 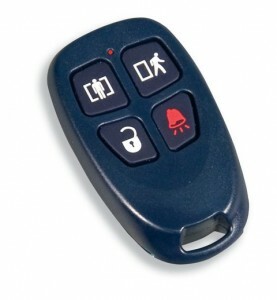 The key-chain remote pictured, has 4 buttons, one for arming in STAY MODE when you’re home and one for arming to AWAY MODE when you’re leaving home. It also has a DISARM button to disarm your system without punching in a code. The fourth button is a PANIC button which is like pressing the police emergency button on your keypad. Even with more advanced technologies available, key-chain remotes remain an incredibly popular tool for each member of your family. They’re also a great option for babysitters or guests who don't want another code to memorize. Logging into your ADT Pulse Web Portal brings you to your summary tab where you find a complete overview of your system. Here you'll find the large system Icon which gives you a graphical representation of the current system status and a text description. A green System Icon means the system is currently disarmed and red means armed. See a video demo of remote arming and disarming here. Available alarm status options will display to the right of the System Icon; simply click your preferred option and your screen will update to show the changed alarm status. The ADT Pulse Web Portal keeps you in touch with your home while at work or on vacation. Android, iPhone and iPad users can access the ADT Pulse App, and use it to arm or disarm your system 24/7. For iPhone and iPad users, you can download the app from the App Store on iTunes and for Android Devices download the app from Google Play. Voice controlled automation is a rapidly growing trend and ADT has taken advantage of the technology to bring you the first home security app that allows your voice to control your home from the ADT Pulse App. With apps such as Google Now, Use Speech on my Phone and Voice Commands Free, you can even open the app by voice. This gives you the ability to check on your house and arm or disarm your system without even picking up your phone. This also makes ADT Pulse a viable option for blind or impaired vision customers. For manual manipulation: When you launch the ADT Pulse App on your phone, the tab options are across the top of the screen. Select the Security tab. Depending on how you have previously set up your app, you will either see the System Icon or the Home View with a smaller System Icon in the corner of your screen. The alarm's status displays below the System Icon or Home View and a button showing the current system status is at the bottom. Clicking the current status button brings up options to select a new status. The screen will update to show your request has been processed. For Voice: To arm or disarm, open the app and after speaking your security phrase, simply speak the command desired. For example, “arm security system,” or “disarm security system.” The app even replies with confirmation that the action has been completed. Download here for Apple Devices and here for Android Devices. As long as you have internet access, you're in business. Using the Mobile Portal to arm and disarm your system is a cinch. Logging in here takes you to your home screen. You'll have a System Icon with a text description below. The Mobile Portal uses the term Security instead of system status to show armed or disarmed status. For example, Security: Armed. By tapping the Security link, you will be taken to a new screen that has available system status buttons. Select your desired arming status and a message will appear informing you that the change will take effect in a few seconds. When you tap the Home link and return to the home page, make sure to refresh the screen so you can see the new status. With 90% of adults carrying cell phones, and 58% of adults carrying smart phones, it only makes sense for our most important systems to utilize mobile technology. Most people use a combination of ways to access their ADT Pulse System, tell us below what works best for you! If you haven’t experienced ADT Pulse for yourself, give us a call at 1-800-310-9490 for a FREE in-home security review. If you are a current ADT Pulse user, don’t forget that we reward you when you help your friends and family protect what’s dearest to them. Use Amazon's Echo devices to arm and disarm your system. If you are not familiar with Alexa, she is to Amazon what Siri is to Apple. She is what is classified as a virtual assistant. Use any Alexa product to arm and disarm your ADT pulse system simply by telling Alexa to do it. See the full blog here.